Welcome to the music program for First Parish in Bedford! 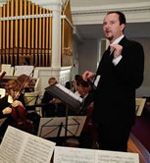 Music is a vital part of the outreach and fellowship of First Parish. 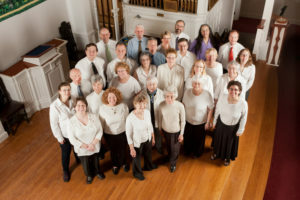 Striving for a multi-cultural and richly-textured experience, the music program consists of four choirs of all ages and abilities, various guest instrumentalists, and a music committee which helps with internal administration of the program as well as bringing in outside groups for approximately four concerts a year. New participants for all choirs are always welcome. Repertoire for all choral groups includes diverse selections from the traditions of classical, jazz, contemporary and world music. The Music Committee is also looking for volunteers. If you would like to be a committee member, you do not need to be a musician (although musicians are welcome); the only qualifications you need is the time to attend one short meeting every 6-8 weeks and to have a passion for being supportive of the music program overall. Open to all after talking with the director. Sings in Sunday services about twice a month. Currently has about 35 active members. Rehearses Thursdays 7:30 to 9:00 PM. For 6th to 12th graders. This group practices advanced singing skills and advanced repertoire. Often in 3 or more parts, the music comes from the full range of classical traditions and a wide variety of genres. There are opportunities to participate in community events and sing with other church choral groups that includes the adult choir. They sing approximately once a month and may also participate in the spring musical or cabaret. Rehearses Thursdays 5:30 to 6:30 PM. Please contact Janet if you want more information. For 3rd to 6th graders. This group learns basic singing and choral skills, which include singing in two parts. They rehearse music from variety of styles and genres and sing approximately once a month at the second Sunday service. There are opportunities to participate in community events, sing with the other church choral groups, and the spring musical. Rehearses Thursdays 3:15 to 4:15 PM. For K – 3rd graders, with some flexibility for younger kids to join after speaking with Janet. Focus on sharing singing, movement games and musicianship. Sings at Sunday services several times a year, sometimes with other choral groups. Rehearses Thursdays from 4:15 to 5:00 PM.